What is the news about probiotics? A few things have been happening recently: first of all, the big news was that Solgar recalled ABCDophilus as a result of some contamination of the product. As many of you will probably know, there was fungal contamination of the final product which was associated with a preterm infant developing intestinal mucormycosis, which was fatal. Quality control and highly reliable products are essential for preterm infants. Complications, expected (at least in retrospect) and unexpected, have been frequent in the brief history of neonatology. I am on record as having suggested that ABCDophilus might be an appropriate preparation for use in the NICU, it certainly appears to be effective, it was the preparation used in the Australian Pro-Prems trial. Solgar, the company that supplies ABCDophilus, do not I think, produce the organisms themselves, they appear to be responsble for the final compounding, which is the stage that seems to have been contaminated. This case emphasizes how essential good quality control is. In order to ensure that the benefits of probiotics are maximized, we have to avoid such risks. As most things in medicine and in neonatology, an intervention should be used based on the balance of risks and benefits, and how those risks and benefits are valued by the patient or their family. Avoidable risks such as this one should of course be avoided. It would be a great mistake to suggest that this is a valid reason to avoid introducing probiotics. Previous problems in manufacture of medical devices or medications have led to withdrawal, correction, and re-introduction. We need reliable and safe products for preterm infants, the one we use in Montreal certainly seems to fit those criteria. In other news, the Pips trial has been presented, although not yet published. This large high quality multi-center trial from the UK randomized 1000 babies to placebo or to a single species probiotic (a Bifidobacterium Breve). The primary outcome variable was survival without NEC or late onset sepsis. NEC stage 2 or worse occurred in 10% of controls and 9.4 % of treated babies. In isolation such a small change could easily be due to random chance alone. Why the benefits of probiotics in this trial should be less (or absent) is not immediately clear. Among the possibilities, this study avoided biases that exaggerated the benefits in other studies: this study suffered from biases that reduced the benefits: the organism chosen was less effective for this purpose (or less effective at colonizing the infants’ intestines): random variation in efficacy across numerous studies. The 95% CI of the relative risk from this individual trial are from 0.68 to 1.27. Which means that although this was a high quality trial, it cannot with confidence exclude a substantial benefit (or indeed harm) or probiotics. Two other trials have also recently been published. Sanjay Patole and colleagues performed a small study with the primary objective of ensuring that their preparation and strain of B breve succesfully colonized their babies, without adverse effects. They had about 80 babies per group (with or without probiotics) and had only one case of NEC, in the placebo group. In another trial, this time from Turkey, probiotics were administered to 2 of their 4 groups, either with or without inulin, a prebiotic molecule. The other two groups were either control, or received only inulin. The 400 babies were eligible if they were under 32 weeks, and less than 1500 grams, and fed before 7 days of age. 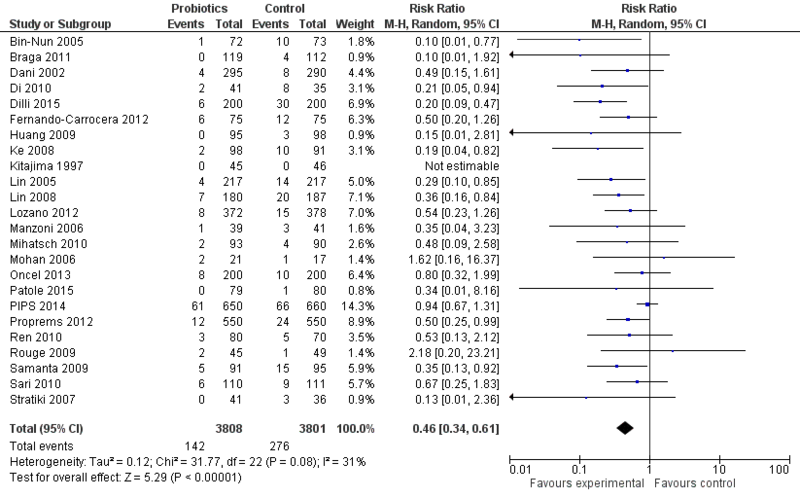 The controls had an 18% incidence of NEC, which was a little lower in the prebiotic group (12%), and much lower in the probiotic group (2%) and combined group (4%). The probiotic organism they used was a Bifidobacterium Lactis. What I think this means is that we now sorely need comparative trials. We have to find out if the differences in efficacy are due to random variation, or is there a real difference in the efficacy of the organisms used. I think it might well turn out that some probiotic organisms, perhaps because of differences in their utilisation of prebiotic molecules (I will come back to this) are less effective at preventing NEC. The only way we will know is if we perform very large comparative trials. NEC is such a devastating disease, with long-term consequences, that we have to find out. Finally, the other news is that a case series of bifidobacterial bacteremias has been published. Two of the 3 cases were transient bacteremias requiring no therapy, the third was an infant who develoepd NEC despite prophylaxis and grew B longum which is the strain found in Infloran, which all 3 affected infants were being given. In contrast to the avoidable contamination of ABCDophilus with a fungus, this complication is, I would think, an unavoidable cost of using probiotics. At some point, after treatment of many thousands of infants with probiotics, it was inevitable that this type of complication would arise. This is not to say that we should ignore this risk, but it must be weighed against the enormous proven benefits. Remember that if you use unpasteurized breast milk in your infants, you are already giving them bifidobacteria, of varying species and strains. B breve, B longum and B bifidum have all been found in breast milk, and probably others also. We do not have the choice to leave an infants gut sterile, in any case it would not be a good idea! Giving a nudge in the right direction with a reliable probiotic preparation is about the best we can do at present. As a post-script I learnt in Australia that Koalas transfer their microbiome as they start to wean their infants. The mother Koala produces a special stool (pap) that is eaten by the baby. Which is just another excuse for a photo. This little guy came into the garden of the house we rented near Apollo Bay in Victoria. 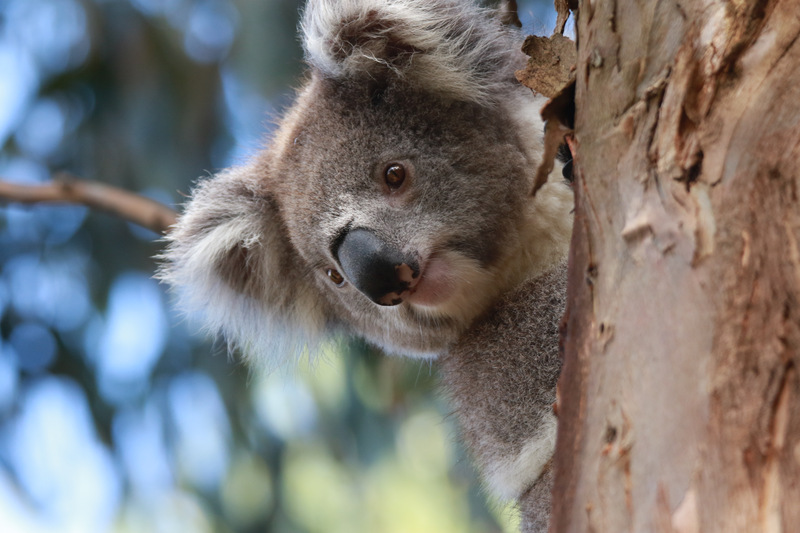 Eucalyptus leaves are a poor nutritional source, and toxic for most mammals, so Koalas need their intestinal microbiome in order to thrive. This entry was posted in Neonatal Research and tagged Necrotising Enterocolitis, Probiotics, Randomized Controlled Trials. Bookmark the permalink. 4 Responses to What is the news about probiotics? When I lasted checked this,it seemed that probiotics with more than one organism were the most effective. The down side was that each of these organisms had different antibiotic sensitivies and might not grow in standard cultures. It was also clear from the literature that there would be the occasional infection with a probiotic organism. On continental Europe they use a yeast as a probiotic, which has caused a number of infections especially in the ill who are ventilated with central lines in situ. I agree that the possibility of complications associated with probiotics have to be balanced with the benefits. In a place with high use of unpasteurized mother’s milk, like mine, the chances of getting NEC is low but we decided to use probiotics becauce we considered that a 5% incidence (4 VLBW) per year was too much. We are still debating if we should extend the use of probiotics to all premature infants as suggested by the most recent meta-analysis in the Cochrane Review. In the population from 34 to 36 5/7 weeks we did not have a case of NEC in the last 3 years. Do you use probiotics only for the VLBW infants in your place? We give probiotics to all the infants under 33 weeks gestation, as that is the group where they have been proven effective. In the last year we have had 2 cases in full term infants (with other risk factors) and a severe case requiring resection in a baby of 34 weeks. We still don’t use them in those infants as they are not proven effective, and we would have to buy tons to cover all of them, but I wonder if all babies shoudl not receive them, except those that stay with their mothers and are breast fed. We have reviewed the evidence in my group (tertiary-care NICU in Puerto Montt, Chile) and have decided to restart the use of probiotics in our premature infants. We had stopped prescribing them for a time after the Solgar scare, but the evidence in favor of its use keeps mounting. Is there a website where I can access your own protocols of probiotic use?